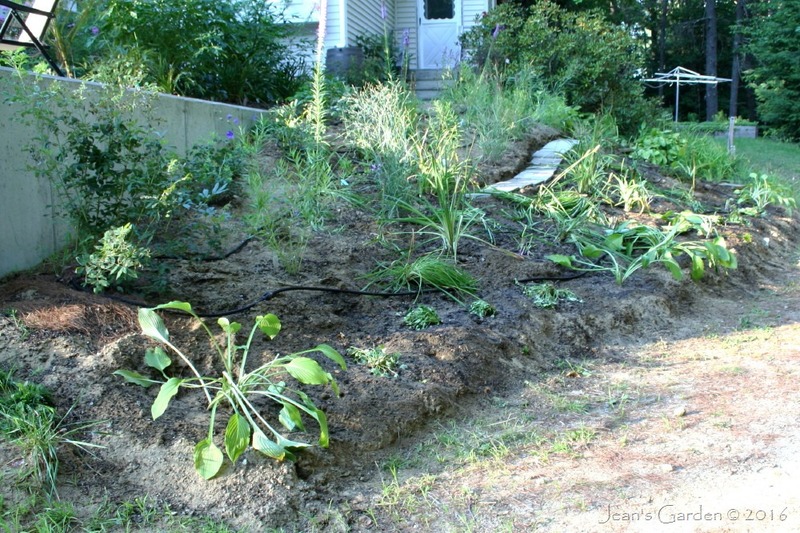 My big garden project for this summer has been to turn the weedy slope that runs along the side of my driveway into a mixed planting of perennials and shrubs. 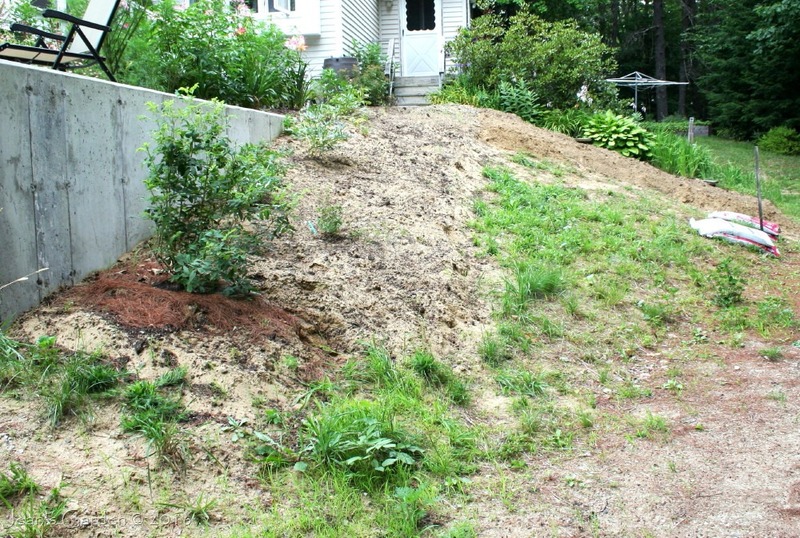 This is a large area (almost 450 square feet) and it consists mostly of backfilled soil from the construction of the retaining wall. Even before the soil was disturbed by construction, it was loamy sand with little organic matter (a soil test returned a value of .5%) and little ability to retain moisture. Before I could put in plants in this area, I needed to add organic matter, a time-consuming process. I added 1.5 cubic feet of compost and composted cow manure to each 6 cubic feet of soil, a process that took 45 – 90 minutes for each 6 square feet of soil surface. I began working on this planting in early June, with a goal of finishing by the end of August. 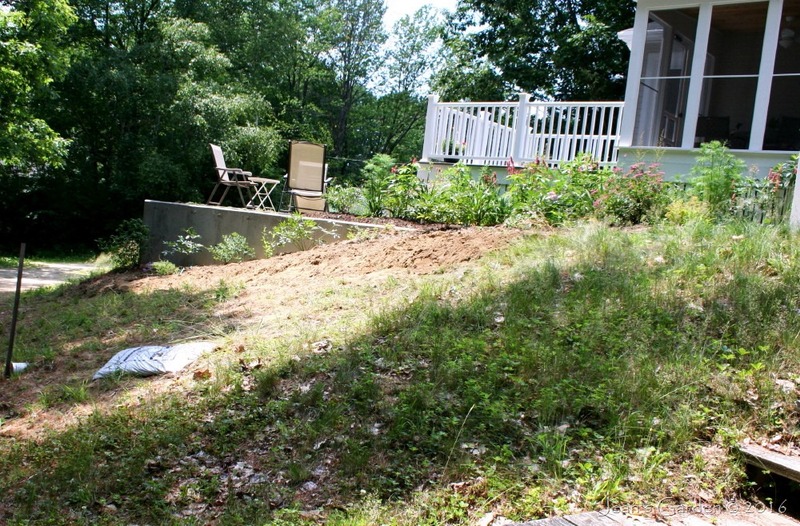 By late June, I had amended the soil in a 3-4 foot swath along the top of the slope and put in a row of plants. For the next two months, I continued to amend the soil in six-square-foot sections, first working my way down the wide end of the wedge-shaped slope, from top to bottom, then along the top of the remaining unworked area, then alternating vertical swaths from top to bottom with horizontal swaths from wide end to narrow end. By the beginning of August, as the remaining wedge left to be amended got smaller and smaller, I could see the end in sight and began to visit nurseries to buy plants. Two weeks ago, I decided to take a break from preparing soil and spent three days putting in the remaining plants for the top half of the slope and also adding a row of stepping stones at the middle of the slope to provide access for maintenance. With the Side Slope now planted, I have finished creating my Entry Garden, the plantings that guide a visitor up the stairs from the driveway to the entrance level of my house and then along the walkway to the front door. These plantings include three flower beds around the front door (the Blues Border, Porch Border, and Patio Border) that were created last year and the new Side Slope and the old Back Slope that flank the stairs up from the garden. I’m giving myself a few days break from major garden projects. Then, next week, I will begin work on the Fragrant Garden at the front of the house outside my bedroom window. I admire that kind of effort! Also, I am suffering from hemerocallis envy when looking at that plan; it looks wonderful! Soren, I’m not normally a big plant collector, but I make an exception for Hemerocallis. I’m always ready to add new varieties to my garden. And it is easy to do here with several daylily nurseries and daylily breeders nearby. Kevin, Not breaking my back is the reason it takes me so long to get this done. After two stints of physical therapy last year, I am carefully pacing myself. With this section of garden done, I’m trying to get myself psyched up to start on preparing the soil for the Fragrant Garden. Great post, Jean! Thanks for the chronicle on the unglamorous part of gardening — In order to get the results you want, start with good soil. It has taken me twelve years to amend the soil on our property because it was over cotton farmed and the woods over logged. It is a daunting task, but well worth the effort in the end. Your slope garden will now thrive and look fabulous for years to come! I also like your mention of adjusting the location of plants from what they were on paper. Sometimes that becomes necessary for some reason when you get the actual plants laid out on the ground. We gardeners have to be flexible in accommodating mother nature. I look forward to reading about the Fragrant Garden you are working on next. Kathy, I think that gardening is like painting (a room, not a picture): 90% of success is in the preparation. I never find that my two-dimensional plans on paper work out exactly when I get to the three-dimensional earth. Happily, most plants can be moved if we don’t get it right the first time. 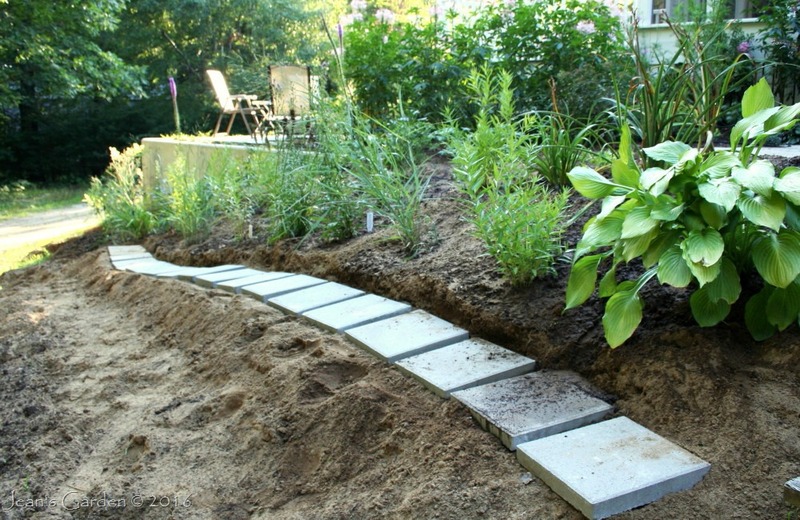 I hope to start on preparing the soil for the Fragrant Garden this week. My original plan was to prepare the soil this fall, design the planting over the winter, and then get the plants in the ground in spring. That changed, however, when I learned that my favorite nursery is closing this month (the owners have decided to retire) and is having a big closing sale. 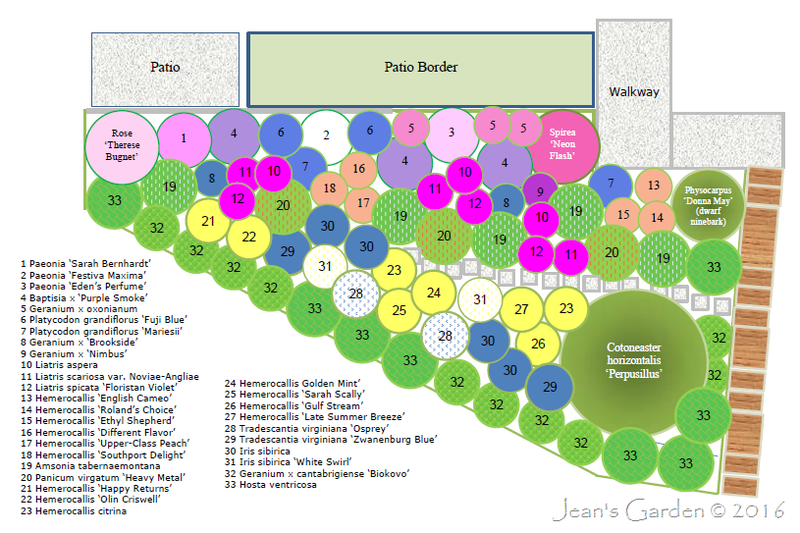 So I’m trying to work on the design now so that I can buy at least some of the plants this month and get them in the ground. Diana, I’m watering this planting every 2-3 days (still no rain here), and some of the floppy transplants are already starting to perk up and put out some new growth. There are even a few flowers in evidence — although most won’t bloom until next year. Congratulations Jean! Work on the quality of one’s soil is one of the least glamorous garden tasks I know of but SO rewarding in the long run. I’m sure you, your visitors and your blog readers will all appreciate the results next year. Best wishes for a wonderful holiday weekend! Kris, Since most of my gardening experience is with this soil that is one step up from beach sand, I think of soil preparation as an essential part of gardening. One of the nice things about planting in late summer/early fall is that the plants are already in their second year growth stage by the time they emerge from the ground next spring. Definitely something to look forward to! It’s amazing what you’re able to accomplish on your own. Good job! I can’t want to see what it looks like next year. Helen, I’m a “slow and steady wins the race” type of personality; so I just divide big jobs into manageable pieces and plug away at them until they’re done. It’s good to be able to check this one off the list. Congratulations and well done! I really am looking forward to your posts about this area, as well as the rest of your garden, next year. You have made so much progress! Thanks, Deb. I’m looking forward to enjoying the fruits of this year’s labor next year. I have a huge garden in my home as my dad is a plant lover. Your idea is really great !! Thanks, Abhishek. Now I need to start on the next project. Great work and excellent plant selection. 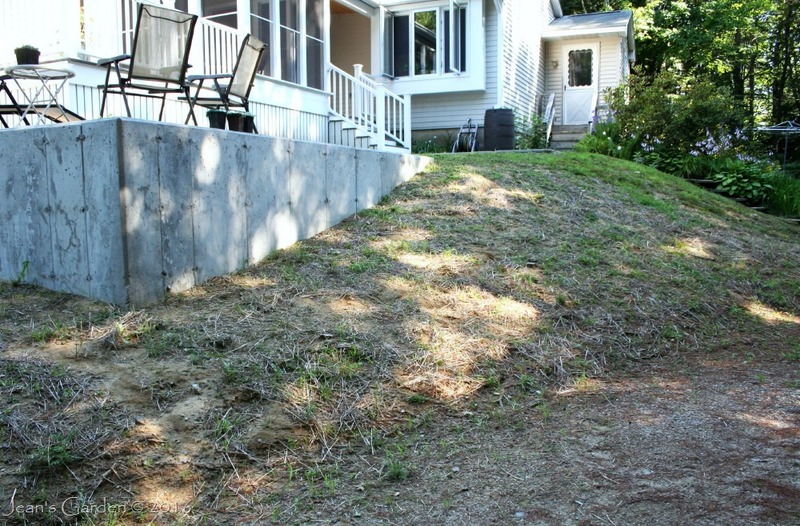 Do you think you will need some kind of low retaining wall at the base of the slope? Jason, Right now, I’m getting a little runoff of dirt from the bottom of the slope when I water, but it should stabilize once the plants extend their roots. Very nice work! I live in Zone 7; north Alabama. I would have been completely overwhelmed to take on the job that you did! We moved to a new place, back in June, and the previous owners must have been averse to flowers, except a few rhodies in the front. At least we now have trees. We built our previous home on an old cotton field. As charming as that may sound, it was devoid of trees, and I ended up having to plant everything. (That is, my hubs ended up…) Anyway, now I’ve got tons of sweetgum trees that I’ll need to plant around. Which is fine, bc now I get to buy shade-loving plants/flowers. Woohoo! Stephanie, Like many Mainers, I’m a total wimp about heat, so I would have been overwhelmed by this job, too, if I were trying to do it in Alabama. My landscape issues are probably the opposite of yours — I live in the woods, and the trees are always threatening to take over any vacant space. I spend a lot of time in spring pulling up new seedlings and keeping some space open for sunny gardens. I would l-o-v-e to visit Maine! You should! Maine is a beautiful place. Acadia National Park and the Coastal Maine Botanical Gardens alone would make a visit worthwhile, but there are many other beautiful spots, too (including the new Katahdin Woods and Waters National Monument). Many people consider August the best time to visit, but I’m also partial to June (which would probably feel to you like revisiting spring). And October is peak season for fall foliage. Well done. Slopes are always a challenge. Amy, Slopes are a challenge. I found it very hard to think about how the design would flow from the top of the slope to the bottom. I’m sure I’ll find myself moving some things around and correcting some mistakes in the next year or two. It wouldn’t be gardening if we weren’t moving things! Hello Jean, it was exciting to read your progress on this large front border as the process is so similar to what we have been doing to the borders in our garden: removing the weeds and killing the grass, adding organic matter and compost to the soil, turning it all over, sculpting it out and then finally planting. It’s amazing the amount of work that needs to be done before the first plant can go in but your results are amazing, especially considering what you first had to start off with!